Astonishingly, this looming possibility of war with Russia has gone largely unreported and entirely undebated in mainstream American media. Neither Batchelor nor Cohen can think of a precedent for such a media blackout or indifference. The situation, according to Cohen, is quite different in Russia, where NATO’s buildup is hotly debated on, for example, prime-time television talk shows. 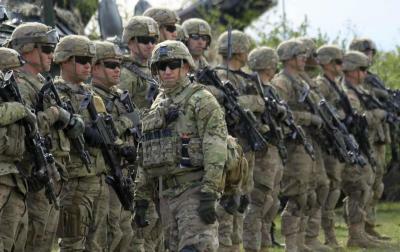 In what is likely to be its most significant move, the Warsaw summit is expected to give formal approval to a plan to deploy four multinational battalions along the eastern flank—one each in Poland, Lithuania, Latvia, and Estonia. Although not deemed sufficient to stop a determined Russian assault, the four battalions would act as a “tripwire,” thrusting soldiers from numerous NATO countries into the line of fire and so ensuring a full-scale, alliance-wide response. Tom concludes, "... thrusting soldiers from numerous NATO countries into the line of fire and so ensuring a full-scale, alliance-wide response." And if there were no military presence, Russia would just walk across those countries like they did into Crimea. When they advanced into Ukraine, resistance from Ukraine prevented a full takeover of the country. And Putin lied and lied to his people about it. The NATO forces in the Baltic countries are akin to the Ukrainian forces. That's not my conclusion, it's quoted material. The portrayal of Russia as unprovoked aggressor is the story pushed by neocons in both our major parties, but it's far from accurate.